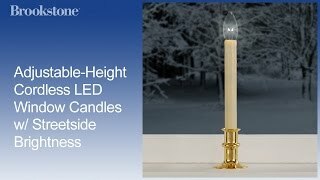 Our battery-powered window candles have unique "streetside brightness" feature. Our adjustable-height window candle adjusts from 10 to 12 inches with a single twist. Adjustable-Height LED Window Candles shine bright outside, soft inside. Give your home some festive holiday appeal. Unique, dual-glow bulbs shines brightly toward the outside of your home, but casts a softer glow toward the inside of your home. Use them on mantels, window sills or with holiday décor on your dining room table. There’s no need to run around the house turning on your holiday candles as soon as the sun goes down. These cordless window candles have a built-in, set-and-forget timer. They automatically turn on for 6 hours and off for 18 hours. And they’re durable. Each bulb lasts up to 100,000 hours for use season after season without replacement. Adjusts to fit any window. Want to create a unique look or an eye-catching holiday centerpiece? These battery-powered window candles adjust from 10 to 12 inches allowing you to customize your holiday décor. Warm up your winter evenings with our festive cordless Christmas window candles. Order from Brookstone today!